MADISON, Wis. — Sometimes dairy scientist Michel Wattiaux approaches his research like a cop at a traffic stop. He uses a breath analyzer to check for problematic products of fermentation. Last spring, the University of Wisconsin-Madison researcher began using a specialized device to measure the methane being exhaled or belched by a group of Holsteins and Jerseys. It was the first step in an ongoing study by dairy scientists, engineers and agronomists to see how a cow’s breed and forage consumption affect the greenhouse gases generated by her gut and her manure. Greenhouse gases, which collect in the atmosphere and trap the sun’s radiation, are a big issue for the dairy industry. Methane is a concern because it’s particularly potent — it traps about 30 times as much radiation as carbon dioxide does — and a cow generates a lot of it in her rumen, the huge stomach chamber where microbes are fermenting as much as 200 pounds of plant material. Also worrisome is nitrous oxide, another potent greenhouse gas that is emitted from manure during storage and after it’s spread in the field. The U.S. dairy industry has set a goal of reducing its greenhouse gas emissions by 25 percent by the year 2020, and UW-Madison researchers are helping identify strategies to accomplish that. Sampling the cows’ breath was the first in a sequence of experiments designed to measure greenhouse gas emissions at three critical points: from the cow’s breath, from her manure during storage, and from the field where her manure is spread. The researchers are looking at how three variables — breed of cow, type of silage fed, and relative levels of forage in the diet — affect greenhouse gas emissions at each point. While versions of each of these experiments have been done on a standalone basis on the UW-Madison campus, Wattiaux said this is the first time the three have been integrated so that emissions originating from a cow and her manure can be tracked from barn to manure storage to field. “This is the first time where we do the nutrition part, the manure storage part and the field application part sequentially, and then put it all together to give the Wisconsin dairy industry a solid number for how much methane and nitrous oxide comes out of their farms depending on the breed, the kind of diet and the amount of forage in the diet,” he said. 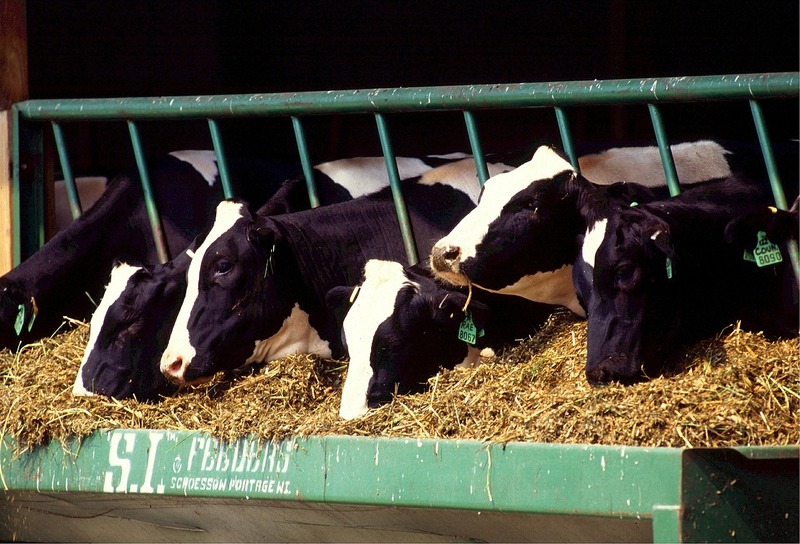 For the first experiment, which began in June and ran for four months, researchers fed 24 Holsteins and Jerseys a ration that included either alfalfa silage or corn silage, the two primary forages fed on Wisconsin dairy farms, along with some grain. Some cows were fed high levels of forage relative to grain, while others got less silage and more grain. Researchers periodically sampled each cow’s exhaled breath using the GreenFeed system, an analytical tool designed to determine daily methane emission. In the second experiment, the manure from the cows was collected and held in barrels for two months to simulate manure storage on a dairy farm. Graduate student Elias Uddin collaborated with biological systems engineering professor Rebecca Larson to measure emissions of both methane and nitrous oxide from each barrel for 60 days. The third experiment began at the end of October to simulate the post-harvest manure spreading typical of many Wisconsin farms. Researchers applied the stored manure to 24 field plots at the Arlington Agricultural Research Station. Under the supervision of agronomists Greg Sandford and Randy Jackson, a team of students began monitoring emissions from the plots last fall and will resume this spring. Wattiaux believes that the findings from this research will be useful to scientists who create whole-farm decision models that producers use to predict the outcome of various management practices. He likens it to software such as Wisconsin’s SnapPlus, which farmers use to minimize soil and nutrient loss from their fields.